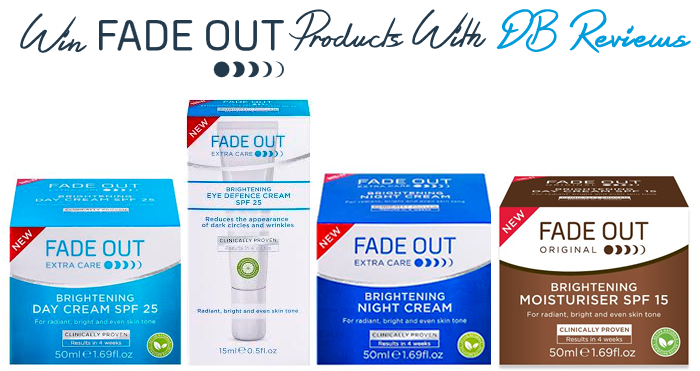 One of the things I love about blogging is being introduced to new brands and one such brand is Fade Out whose product range has been developed specifically to even skin tone, whilst hydrating and protecting the skin. Their formulations use natural active ingredients including Niacinamide (naturally occurring Vitamin B), Licorice and Mulberry extract. All the ingredients work in harmony to reduce areas of hyperpigmentation caused by sun exposure, ageing and hormonal changes, leaving your skin looking bright, radiant and even toned. The lovely team at Fade Out have offered to give away a bundle of their products to one lucky reader of DB Reviews. Want to win the products shown above? It is very simple. Enter using the Gleam widget below and you might be the lucky winner who takes it all. All the best! Awesome competition, thank you so much for the chance!